What does this mean for migraine sufferers? One of the biggest knocks against chiropractic is the lack of peer-reviewed studies on things not called neck and back pain. Even though our office has a really remarkable success rate with chronic migraine headaches using the NUCCA procedure, the truth is that there hasn’t really been any evidence to support this. Fortunately, the great team at the Upper Cervical Research Foundation decided to do something about it. The authors studied a cohort of patients that were screened by a neurologist at a headache center. The headache center primarily studies patients who no longer respond to standard drug therapy for migraine headache. Each patient was to have 10-26 headache days per month, no recent history of head/neck trauma, and no prior experience with chiropractic care. The patients then went through a NUCCA chiropractic exam, filled out 3 headache surveys, began a headache diary, and underwent a specialized imaging technique called phase-contrast MRI to measure the effects of an Atlas Correction. These patients were followed and assessed at 4 weeks and 8 weeks. 2 patients volunteered for a 24 week follow up. So with this study there’s good news and bad news. After 8 weeks, 10 out of the 11 subjects showed a large decrease in the number of headache days per month. Subjects also showed substantial improvements in a Health Related Quality of Life Survey. 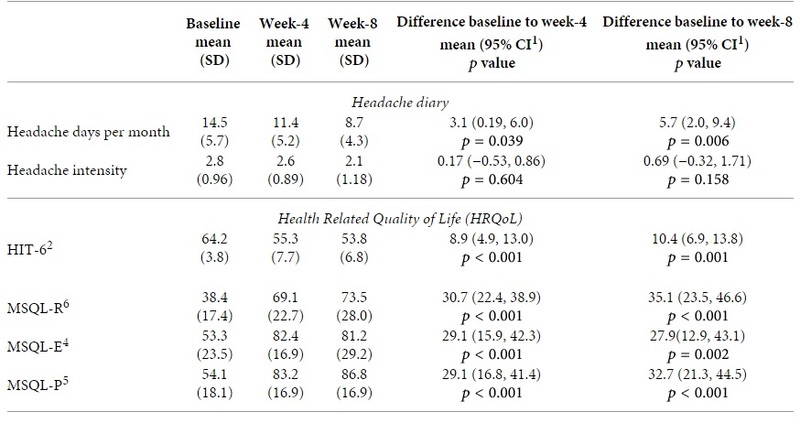 Headache days decreased by almost 50% over the course of 8 weeks while quality of life indexes showed about an average 30 point improvement (on a scale of 100). Headache patients show improvements across their headache diaries and survey scores in quality of life. Image from Full text of study. Subjects showing decrease in headache pain scales over time. That’s great stuff! While the sample is small, there are several drugs and substances that would love to demonstrate that kind of response. One of the big reasons this study was performed was to understand the mechanism for how the Atlas causes a neurological problem like migraine headaches. By understanding the cause, we can develop a stronger understanding for how a correction helps. A case study by the Upper Cervical Research Foundation sought to measure changes in blood and fluid flow (hydrodynamics) by correcting the atlas. The case study showed a substantial improvement in headache status, but also an improvement in something called Intracranial Compliance. Compliance is what allows the body to regulate volume in the brain. Remember that rigidness of your skull makes your head a closed system with your brain sitting inside. If you increase fluid into the head without a way to drain it, you will increase pressure in that closed system. As that the pressure increases, you must either drain the fluid, open up the skull, or push the soft brain material away. That’s why the veins in your head are important. If you exercise and increase blood into your head, you need your veins to decrease blood at the same rate so the pressure stays the same. Your soft brain does not want more pressure on it. If you have low compliance, it means the head cannot tolerate and adapt to changes in volume. If you have high compliance, your head can tolerate changes in volume without affecting pressure. Makes sense right? Better compliance means less pressure changes on the brain and less potential headache. It seems like the case study may have been a coincidence. The 11 subject cohort didn’t show a statistically significant difference in compliance in the patients. In fact, a few of the patients actually saw their compliance levels decrease. While we can’t rule out the adjustment having an impact on compliance inside the head, the signs certainly seem to point that this isn’t what makes an Atlas Correction work. Previous migraine studies show that migraines are something that are commonly influenced by placebo, so without a good physiological mechanism, we have no idea if these great results for migraines are just in someone’s head, or if it was from what we did. All of the patients were from a migraine clinic where the patients have already failed the first line of migraine medications, making a placebo a little less likely. On long term follow-ups, the patients showed continued improvement after the experiment was complete suggesting a physiological effect from a correction, as opposed to regular stimulation from regular manipulation treatments. After 5+ years of practice, it’s very difficult for me to believe that what we do with NUCCA and Atlas Correction is a result of placebo. I’ve just seen too many cases where a patient has been everywhere and has seen every migraine expert from Cleveland Clinic to Mayo trying to get relief. Yet 2 weeks after getting their atlas corrected, their life is exponentially improves. This isn’t something that happens once in a while. This what we see on a weekly basis. While Upper Cervical Doctors may have to go back to the drawing board to figure out why correcting the atlas can help so many migraine patients, I think it’s time to show that statistically that migraine patients need to have their neck evaluated for Atlas Displacement Complex as a primary recommendation. It’s time for NUCCA to be put to the test in a randomized clinical trial, but based on what I know about this work, I’m confident that we are up to the task.